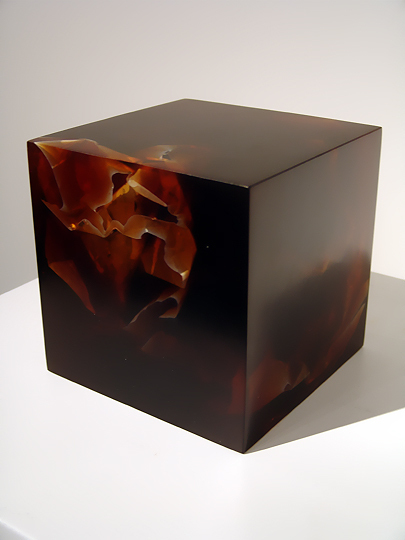 Mayme Kratz' art focuses on the concept of embedding objects within blocks of cast resin. In many of her works, she uses found objects from the Arizona desert where she lives... insects, seed pods, and even entire cacti have found their way into Mayme's works. In other works, Mayme embeds poems that she has written. This is one of those works. trying to touch what disappears. You, me, and the vapor of maybe. You, were never who I thought you were. I have no memory of. But I guess the coolest thing about this work is how the poem is embedded inside the resin, similar to an insect embedded in a piece of amber. Who knows how long the poem will remain locked away, protected from the world?